The cause of the majority of equine lameness is usually to be found in the horse's foot. So the first place to look if your horse or pony becomes lame is the hoof. The most common hoof and foot problems and ailments are Bruised Soles, Thrush , Seedy Toe, Laminitis, Punctured Soles/Infections, Sand Crack and Nail Bind and Nail Prick. Bruised Soles are the result of an injury to the sole of the horse's foot, usually caused by the horse stepping on a stone or other hard object. Concussion from work on hard ground, or poor shoeing can be other causes. The symptoms of a bruised sole are: Acute lameness - Painful reaction when pressure is put on the sole, Red bruised areas visible on the sole of the horse or pony's foot. If you horse has a bruised sole restrict his movement and keep on a soft surface until sound. Your farrier may put a temporary pad under the shoe for further protection. If your horse is in a lot of pain it would be wise to call a vet to check for any infection. Thrush in a horse's foot is a bacterial infection, caused by standing in damp or dirty conditions such as muddy paddocks or wet stable bedding and/or poor hoof conformation . If left untreated thrush can spread into the sensitive, internal parts of the hoof. The symptoms of Thrush are a foul smelling discharge around the frog and sometimes lameness. Treat Thrush by regularly scrubbing out the foot and topically applying one of several substances suitable for the treatment of thrush in horses - these include honey, eucalyptus oil, peroxide and copper sulphate as well as commercially manufactured solutions. Your farrier should pare the frog to take away any damaged tissue. In severe cases it may be necessary to consult a veterinary surgeon. Help to Prevent thrush, by maintaining good hoof care for your horse by keeping the feet clean and regularly applying eucalyptus oil or honey during the winter, and if necessary during the summer. Ensure that bedding in the stable is kept clean and dry. Seedy Toe is the separation of the wall of the hoof from the sensitive laminae at the white line. Usually it begins at the toe and progresses up the wall of the . The resulting hole becomes filled with debris and dead horn material and is prone to infection by yeasts and anaerobic bacteria. It generally occurs when the toes of the horse's feet become too long, but it can be a result of chronic laminitis, poor hoof quality or concussion on hard ground. Seedy Toe needs to be treated by regular trimming of the hoof and allowing the hole to grow out. Some of the tissue may need to be cut away and packed with putty. If there is an infection or the horse is lame, contact your vet, as treatment with antibiotics may be necessary. There are several causes of Laminitis - the main one being too many carbohydrates in the horse's digestive system. Other causes include heat, frost, shock, stress, treatment with steroids and fever. A horse with Laminitis will be reluctant to move and will stand with its weight leaning onto his back feet. It is most often the horse's front feet that are mainly affected by Laminitis. If you suspect Laminitis remove your horse from grass and call your vet straight away. 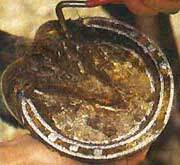 This is caused by a puncture wound to the sole of the horse's foot and is most easily diagnosed by your farrier. A horse with an infection in a punctured sole will be extremely lame due to pain caused by inflammation in the foot increasing pressure on the wall of the hoof. The hoof will usually feel very hot and the horse will react to pressure applied to the sole of the foot. To relieve the pain call your farrier or vet to cut out the infected area. This should be followed up by poulticing to draw out any remaining infection. A deep puncture wound can cause infection in the navicular or pedal bone - which requires surgery. Any puncture wound is a way for tetanus to enter the bloodstream - make sure your horse is up to date with his anti-tetanus vaccinations. Nail bind is a term used to describe where the nail has been driven in too close to the sensitive laminae in the horse's foot. Nail prick is used where the farrier has actually driven a nail in the sensitive part of the foot. The signs of Nail Bind or Nail Prick are lameness following being shod, either immediately or a few days later. Tapping the hoof will cause a painful reaction. If your horse goes lame just after shoeing this is the first thing to suspect as a cause. To treat Nail Bind or Nail Prick call your farrier to remove the nail. The foot should then poulticed . If lameness continues call the vet. Make sure your horse is fully vaccinated for tetanus. A Sand Crack is a crack in the hoof that begins at the coronet band and works down. A Grass Crack starts at the ground and runs upwards to the coronet band. They are caused by poor hoof condition, poor foot conformation or sometimes injury. A farrier can treat these conditions by cutting a groove in the hoof wall below or above or the crack. A grass crack can also be treated by putting a clip around the start of the crack. Eventually the cracks should grow out. A biotin supplement in the horse's feed can help to improve hoof condition. Common Hoof and Feet Ailments and Injuries of the Horse. Causes, symptoms and treatment of common hoof and foot problems in horses - Bruised Soles, Thrush, Seedy Toe, Laminitis, Punctured Soles and Infections, Sand Crack, Nail Bind, Nail Prick.